← To solve problems you can’t just think about them; you must act. In a box of papers I found upstairs in my barn this weekend was a letter, folded in quarters, and accompanying three of those 90’s era 3.5 inch computer disks, all tucked into a small padded envelope. 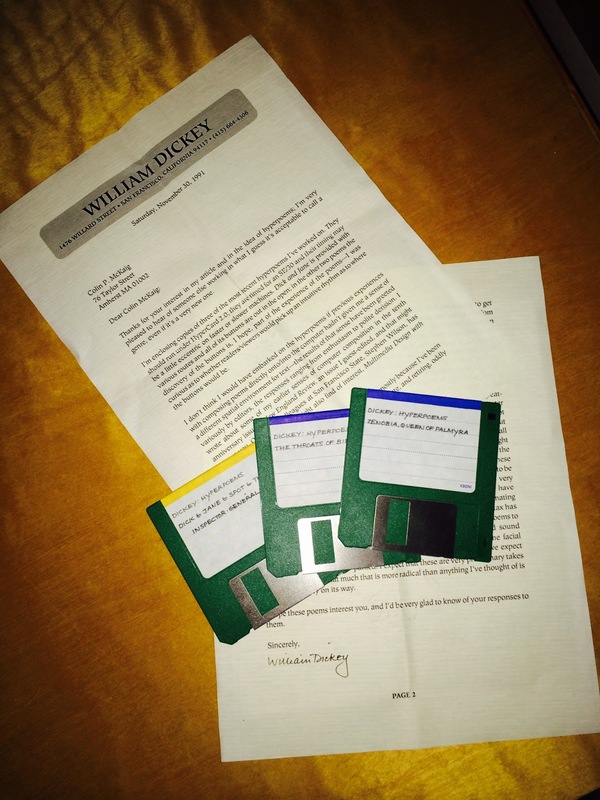 The disks were hyperpoems, written by the San Francisco poet William Dickey. We’d been corresponding, sharing our contributions to what was at the time an exciting new way of understanding the written word. It was 1992, without the internet as we know it now, and we were both writing in Hypercard, an Apple software which many might remember as the precursor to web pages. I was an MFA candidate at UMass Amherst, and he was at San Francisco State, both of us wondering about new ways to present our work to the world. We put text and images on stacks of virtual cards, and these were all linked poetically, in a manner thoughtfully designed. Or so we hoped. Our work seemed so avant garde at the time, really cutting edge. Though for mine, it seems now, the conceptual framework was more interesting than the poetry. I wish I could slide those disks into a computer and see his poems, 22 years later, through the lens of my Web 2.0 eyes. These early experiences with the written word and computer technology certainly planted the seeds for my current passion: mobile technology and neuroscience in the the high school classroom. My first full school year back since my Rowland Foundation sabbatical has me thinking deeply about how the smartphones in kids’ pockets can be leveraged to bolster their engagement and achievement. Animoto and Thinglink are both cool tech tools we’re using. The first is a video creation tool and the second allows images to be tagged with additional media sources. Both run on all devices, essential to our mission. Each of these apps echo those hyperpoems we created. Education has never seen a shift quite like this one. In my career, I’ve seen extraordinary change, ramped up now with abundant wifi, 4G and mobile phones. Kids having immediate access to that much knowledge is stunning, transformative and distracting. With 2.5 billion people online and millions of photos and videos uploaded hourly, the digitally connected world is now our world. It’s a daunting and exciting time to be an educator. I’m trying to allow myself to move further from the center, out into the widening gyre of technology and learning, teaching students with a laptop in one hand and a phone in the other. What an arc of experience. 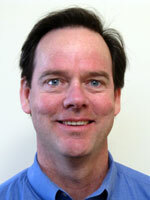 Rowland Fellow Colin McKaig is a member of the 2013 Cohort and is an English teacher and coach at Black River Middle & High School in Ludlow, Vermont. His work as a Fellow will focus on the ways today’s students are digitally connected, and more broadly, how this generation of learners is different from those who preceded them. This is based on his suspicion that brains are changing as a result of this technological shift. He shares that his students know nothing but a digital world. Their lives are wired with an access to information and communication not dreamed of even a short time ago. This has changed how they think in ways that we’re only beginning to understand. This is a chapter from Colins’s story. Tell us yours. This is a great read! Thanks Colin!